If you have a coat that you would like to donate you can drop it off in the Compassion Center off Eastern Ave (1706 Eastern Ave., Baltimore, MD 21231). If you would like to contribute financially you can do so here: http://www.baltimorechurch.com/give. In Philippians 2:12 Paul encourages the church to obey whether he is present or absent. And we spent a good chunk of time on Sunday night considering the ramifications of presence. The perception of absence has typically lead to the devolution of man's integrity. But in truth, God is now present in our lives and we are called to live according to that reality. Also, we are called to be imitators of God who go into the world with his presence. Jesus is our example of being incarnate... becoming present in other's world. "The core idea of the Christian faith is the incarnation: God took on flesh and dwelled among us. To other religions such and idea is considered odd or, worse, inconceivable or, even worse, blasphemous. And yet as centrally as we hold the idea of the incarnation, there is a grave danger that we are leaving the implications of the great idea behind us. Whereas Jesus Christ was God incarnate and his church was called to an incarnation lifestyle, today we find ourselves drifting towards excitation--the defleshing of our faith. We have been moving through a disembodying process that has left us feeling rootless and disengaged, connected to our world more and more through screens rather then face to face." So consider this... Are you living with an awareness of God's presence and are you in turn being his presence in the lives of the people around you? I'm praying that you and and I can answer "yes" to both of those questions. Paul promises that Christians will suffer. We saw this in our study this past week in Philippians 1:27-29. "Whatever happens, conduct yourselves in a manner worthy of the gospel of Christ... without being frightened in any way by those who oppose you... For it has been granted to you on behalf of Christ not only to believe in him, but also to suffer for him"
Paul talks about the adversaries that opposed the Christians in Philippi. And he says this is part and parcel of being a Christian. Unfortunately, sometimes Christians have adversaries for bad reasons. Rather than having an enemy because a Christian is living worthy of the Gospel, they have enemies because they are doing stupid stuff. Here are three bad reasons to have adversaries. I am not going to site a specific behavior lest I wound a believer unnecessarily. But there are Christians who think the gospel manifests itself through acting out in culturally awkward ways. Do you know why Napoleon Dynamite was so funny? It was because it was filled with weird people. We don't want to be Napoleon Dynamite Christians. Unfortunately, there are Christians who have adversaries because they are ill-informed. They end up spouting off with opinions that are outdated or misguided. Sometimes this is seen when Christians share fake news on social media. Other times we see Christians quoting studies that have been subsequently been disproved of found to be false. There is also the scenario where Christians are caught up with conspiracy theories. If you have adversaries because you are an ill-informed Christian this is your fault and not the suffering Paul was promising. We see this most often on social media as ethics are debated within society. When SCOTUS was weighing and approved gay marriage Christians went crazy condemning the gays. A majority of the Christian media posts were championing a moral standard rather then the gospel message. This is an example of getting off message. Yes, Christianity has a moral standard. But the moral standard isn't our primary message. We also see Christians getting off message when they promote nationalism mixed with Christianity or a political candidate mixed with a Christian endorsement. Again, our faith touches on all parts life; including politics. But if our political convictions become our primary message and we pick up adversaries because of that it isn't the suffering Paul promised. Let's be a people who live as citizens of the God's Kingdom. Our King is Jesus and we champion his charter: the gospel. We will have adversaries. We will suffer. But let's not suffer for bad reasons. This past Saturday Haven City Church had the amazing experience of partnering with three other churches to clean, paint and organize the Compassion Center. Pastor Mark Dooley brought his church, Leonardtown Baptist. We also had Pastor Jeremy and a team from Redeeming Grace Baptist and a whole other team from Summit Church. All in all there were over 40 people working at the Compassion Center. Everyone was assigned to one of six teams and each team had a project that they were focused on. We were able to work on all three floors of the Center and the results were amazing. A big thank you to all who served! As Haven City Church prepares to start public services we have given thought to the liturgy (worship service structure). Depending on the church there are various emphasis and habits placed in the worship service. There are different styles of music and various arrangements of that music. The length of the service can very. The way the congregation participates can very. We have considered many of these things as our church takes shape. For Haven City Church the Bible is the core part of our worship service. When we gather we dedicate a large chunk of our service to reading, understanding and applying the Bible to our lives. A quick rundown of what the Bible says it has to offer is the reason for this emphasis. All of these things are needed in Fells Point, Harbor East, Washington Hill, Little Italy. And so as you attend Have City Church worship services expect to spend a lot of time in the Bible. Make sure you have a Bible that you like and bring it with you when you come! 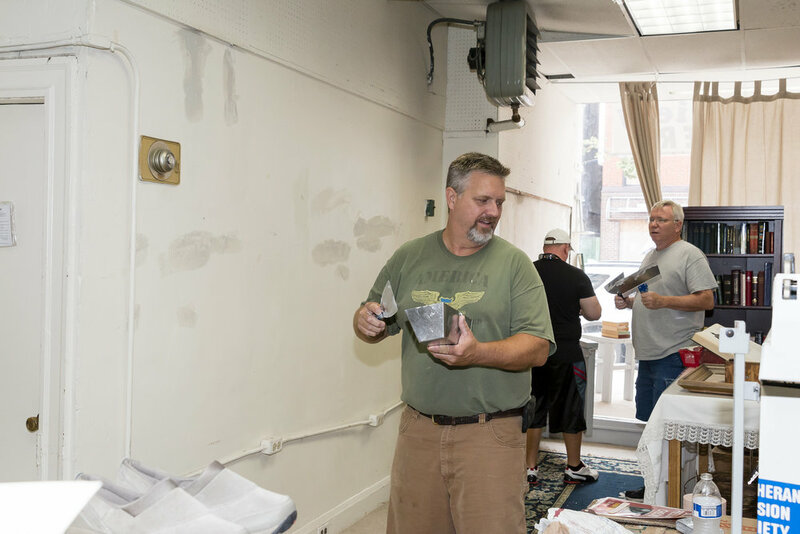 This past Saturday we had a great time cleaning, painting and organizing the Fells Point Compassion Center. We arrived at 8:30 AM with the ambitious goal of rehabbing the front window display. Melinda Turansky was able to get paint donated by PPG for this project and she lead the design effort. Within a matter of hours the old drab curtains were out and beautiful new linen curtain were hung. The fresh coat of paint made a big difference and Matt and Scott did an amazing job of cleaning the windows. Brittany and Diana did a great job painting the grey trim on the entry way and front counter. And Marvin successfully removed the two bookshelves attached to the stairs. Our next workday will be Saturday, July 15th from 8:30 AM - 1 PM. Lunch is provided. Please RSVP on the FB Event or MeetUp Event. Back in early June the Lutheran Mission Society reached out to me about the Fells Point Compassion Center. They have a compelling story. The LMS has owned the Center for the past 50 years and it serves a vital role in the community. On any given day the homeless, first generation immigrants and those impoverished stop into the center to look through the items on the distribution floor. At first glance it looks like a thrift store, but it functions as a center meeting peoples physical and spiritual needs. But... The Center has been in bad shape for the past few years. Foot traffic has declined and the building has fallen into disrepair. It was in need of a change. The LMS offered to let our church use the building as long as we would manage the Center and get it back in good shape. It is a great trade for a new church and an amazing opportunity to love the people of Fells Point. Pastor Josh is now running the Center on Wednesdays and Fridays and the church will begin meeting in the Center on Sunday evenings. We will also begin the cleaning and rehab process over the next couple of months. The walls need to be repainted and the first floor needs to be dramatically improved.